If you ask enough people about domesticated cats being allowed outdoors you will hear a plethora of arguments in both directions. Some people believe the outside world is far too dangerous for our precious furry felines while others believe that cats instinctually belong outdoors and depriving them of this experience is cruel and unusual punishment for such creatures. Other people believe that cats being allowed outdoors are devastating local wildlife (which in some cases is true,) and others believe that cats don't even belong inside at all! It's a little crazy navigating through so many different points of view, all of which are dictated by unique experiences like where someone lives, cats they've had (or lost) over the years, and even educational and professional experiences! However you raise your pets, there are a few people out there who have found a middle ground that is impossible to ignore in the great debate. Have you heard of "catios?" 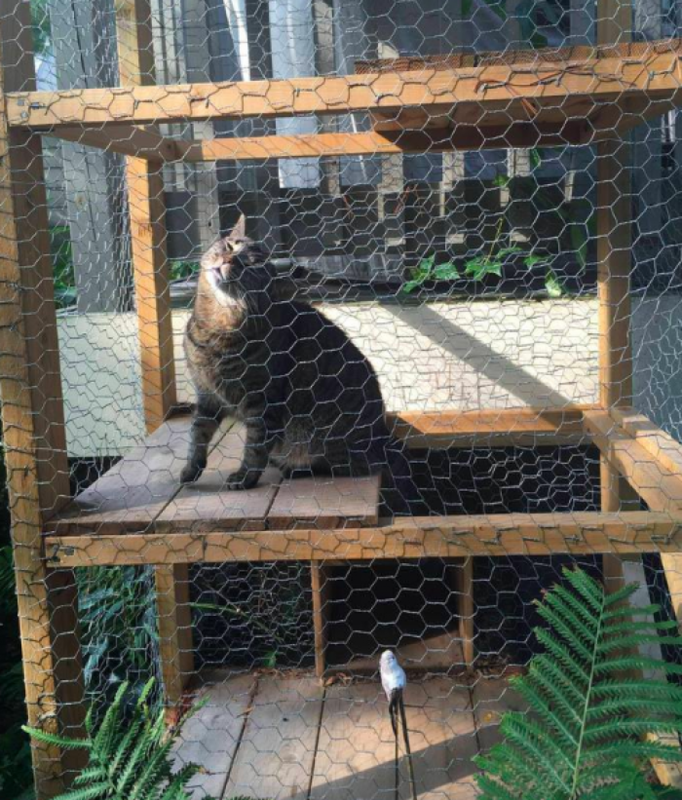 It's an outdoor enclosure that protects your cats from harm (and protects plants and animals from cats!) and they are a big deal in the cat community. 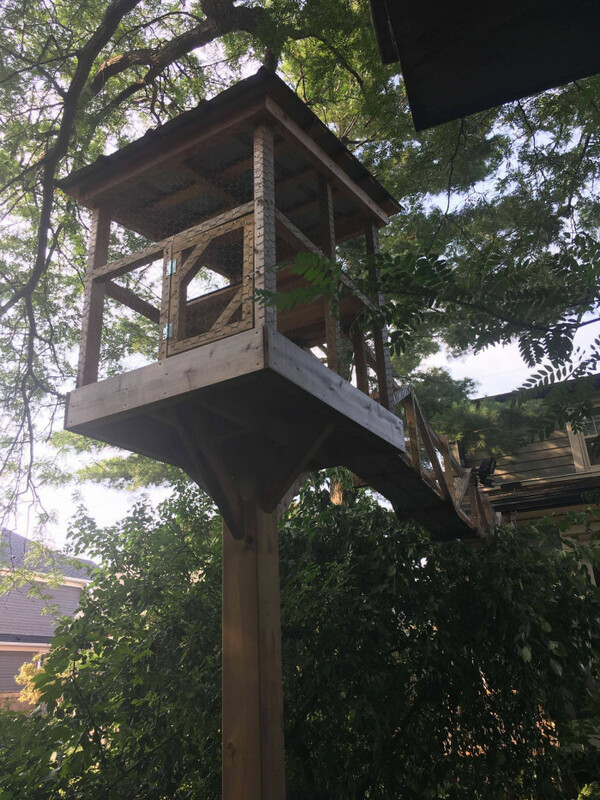 We love seeing photos and hearing stories of cats safely enjoying outdoor time no matter the surrounding environment so when we heard about a family that built a catio-treehouse we were all ears and ready to dive into a fascinating story about the love humans have for their pet cats! 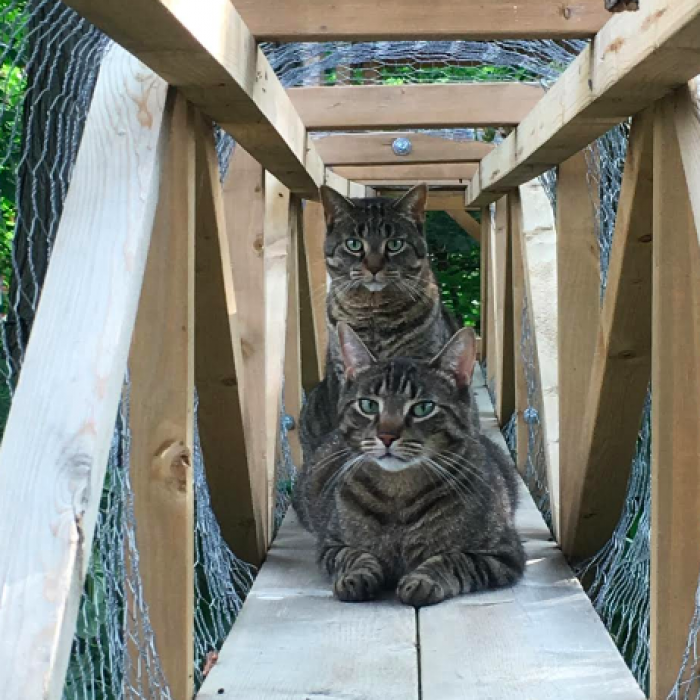 When Hadley, a 21-year old Canadian shared her dad Alex's cat masterpiece on Reddit she probably had no idea it would take the Internet by storm but people could not get enough of her family's devotion to their 16-year old siblings cats, Luna, Daisy, and Marvel. 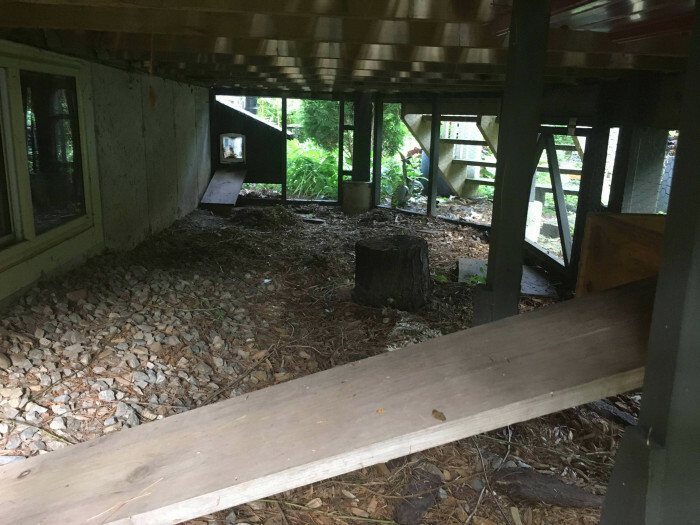 Alex started his project off by building this nifty space for the cats under the deck and it quickly went off from there. When Hadley shared the finished project on Reddit, a lot of people had one major question, "how long did this take!?" It took 20 hours, and that's not including "the time he took making the blueprints for it." It may have been a $300 CAD labor, but it was a labor of love and it's not hard to see that message when Hadley talks about her family and her cats. In an interview with Unilad, Hadley said, "My dad fully built it by himself and the short answer as to why is for safety. Both for the safety of our cats and for the safety of the small bird population. We live in the downtown portion of our city so our road is getting busier every year and there are lots of creatures like foxes and coyotes that could harm them." But the cats wanted out, as most cats tend to. Hadley, her dad, and their family learned the hard way, she said, "Marvel escaped one night and got into a fight with a neighborhood outdoor cat and was hurt, so there are multiple reasons why it isn’t safe for them to be outdoor cats. Cats are also not a part of the local ecosystem and can truly mess with it when they kill lots of small birds or other small wildlife." 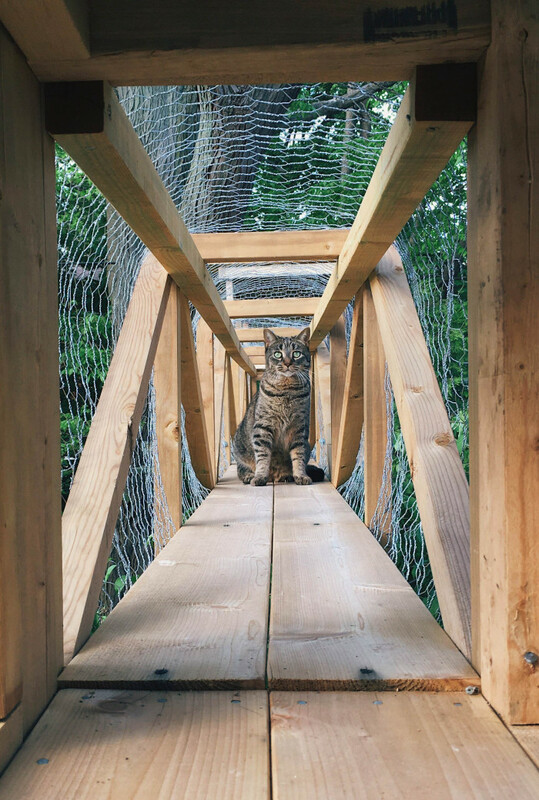 Hadley says that her dad had previous work with carpentry, and jumping on the "catio" craze was a no-brainer for their family. "Catios" is the term coined for outdoor patios designed to keep indoor cats safe while giving them what a cat often craves most, playing outside! Do cats love catios? Yes, definitely! Hadley said of her cats, "when we first let them into the complete cation, Daisy was pretty nervous but was quick to feel comfortable and now she loves it. They all do, especially Daisy and Marvel. Both of them are in it at least once a day. We love it too! We think it’s perfect. They’re a part of our family and you always want your family to be safe. The catio ensures that they are safe! It’s also quite amusing to watch them in it." And Alex isn't finished yet, the cats are so happy that he wants to expand on his project! His plans include expanding it upwards and towards the house, plus adding another entrance through one of the second-floor bedroom windows! And don't fret, if the cats are ever in trouble in their spacious catio, Alex included gates for full-grown humans to get in and help their fur babies. We are sure that all three cats can't wait to watch their outdoor wonderland expand. You can see all the good stuff in action in this video, too! 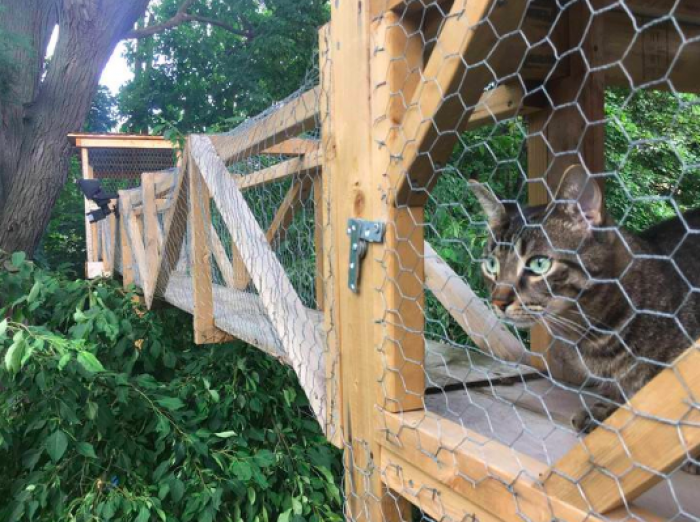 It's hard to have a cat right now and not be totally jealous that your cat doesn't have a catio like this one. 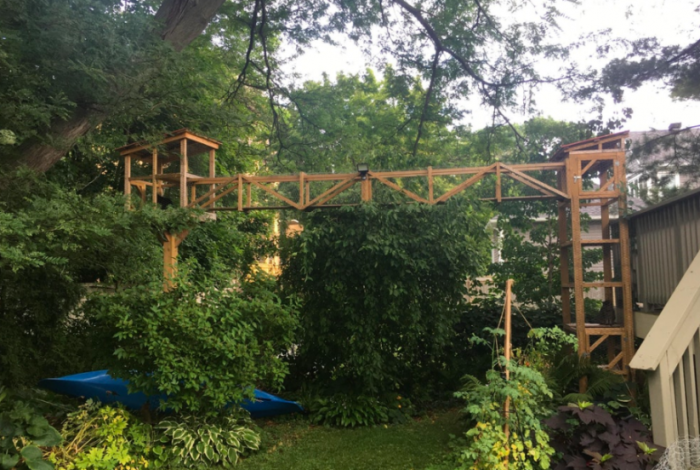 If you're wanting to bulid a catio of your own, check out this awesome advice from the original Reddit thread.